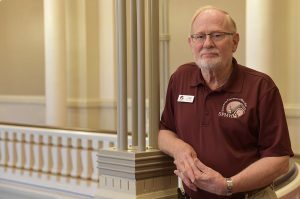 Of all of SPMH’s volunteers, Cliff Goosmann could very well know Music Hall – both pre-renovation and now – better than anyone. He’s been an SPMH Tour Guide for over five years. He signed up to learn more about Music Hall. Giving presentations at Music Hall has made me much more aware of its importance to the city. I’ve done additional guided and independent research to learn the history of the building, the organizations that started there and the neighborhood that Music Hall supported. The more research I do, the more I learned how important Cincinnati was in the 19th and early 20th centuries. Cliff not only helps visitors better know and understand the structure and its history, he researches topics and photographs the interior. His work is incorporated in SPMH Speakers Series Presentations: “Evolution of an Icon,” on the history of Music Hall, “Music Hall in Pictures,” and “SPMH: Restore and Renew,” a feature on the hall’s renovations which highlights SPMH’s mission and role in preserving Music Hall for the future. His love of music brought Cliff to Music Hall and, ultimately, SPMH – as well as to volunteer work with several other music-based organizations in our community. He still finds time to pursue other interests, including photography. He’s done presentations for OLLI (Osher Lifelong Learning Institute), Sharon Woods Photography Travel Series, and the Madeira Library Photography Travel Programs. Cliff combines his passion for photography with his love of travel when he heads out to favorite destinations such as Santa Fe, and Cuba, where he has documented the country and its people during three photography trips.